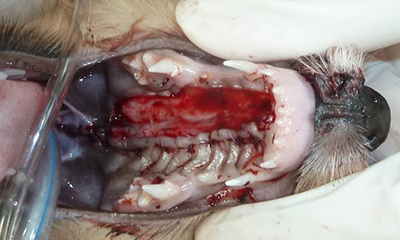 Cleft palate is an abnormal opening in the roof of the mouth and can be a life-threatening condition in puppies and kittens. Commonly diagnosed at 1-2 days of age. Your pet must be tube- or bottle-fed for 8-12 weeks before treatment. If not treated, your pet may have difficulty eating and develop nasal infections (which may lead to pneumonia). 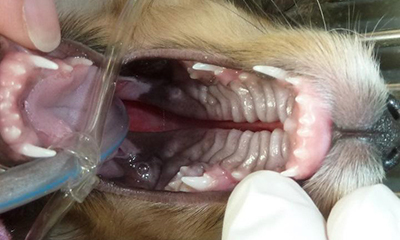 Cleft palate as seen in a 10-week old Sheltie. Surgery is necessary to seal or separate the oral cavity from the nasal cavity. Good healing at 2 weeks after treatment. 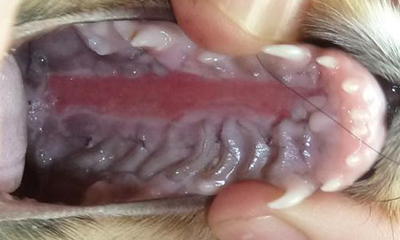 Schedule an appointment today to have your pet evaluated for cleft palate.